This core was excavated in a swale in the field north of the road across from Mound C. We excavated this bore to look for the remains of channel 5 and we thought by placing it in a swale, we might get deeper down to the channel. The plug we removed looked very similar to a core excavated by Kelsey Lowe on her Parchman geomorphology thesis. We did recover a very distinct gleyed clay plug that was overlying some blue sands, which Fisk describes as typical channel deposits. This core went to a depth of approximately 5 meters below surface and was most likely one of the deepest we’ve excavated. This was placed on top of Mound F, which is situated behind mound C. We started hitting a fragic layer about 3 m below the surface, and Rachel thinks this could be the remains of an old natural levee. Fragipan type soils should not be present in this area, as they tend to develop in loess or eolian environments. The deeper soils are silts and clays, which if crevasse soils are originating from channel 11, then by the time the floodwaters made their way to mound F, the heavier soils should have fallen out leaving only silts and clays to fall out around mound F.
We placed this core directly on top of Mound A – getting the Giddings rig up to the top was quite a challenge since we had to drive over various piles of brick and concrete from the house that used to be up there. Based on this core, there appear to be at least two significant construction stages, we found buried A horizons around 3 meters below surface and 4.5 meters below as well. We went down a total depth of 680 cmbs and found no clear evidence of basket loading in the mound fill. 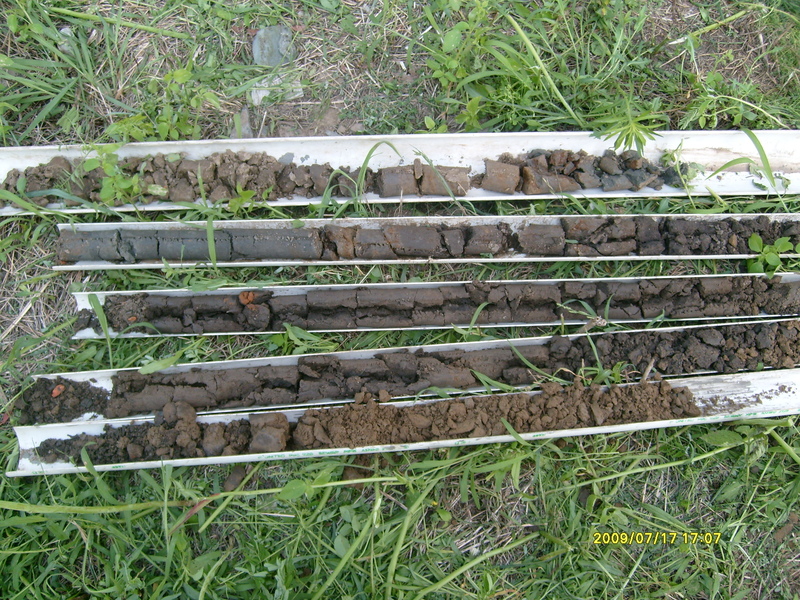 In the core that is second from the top, those blue-gray soils are indicative of channel fill and most likely came from the extant channel 11. Mound A is situated directly on the banks of this channel. About a meter under neath these soils, we found midden and daub and then another buried A horizon below it. Until I obtain the detailed core data sheets for this mound, it will be difficult to interpret it’s stratigraphy. C13 does lend some good information on how this mound may have been built, and certainly, the whole landform was at one time a natural levee for channel 11. It is most likely the case that channel 11 was not an active meander of the Mississippi when the mound was built, but it could have been an active stream or oxbow at the time. When you’re down in the channel, Mound A looks massive and is reminiscent of some mounds down in the Natchez Bluffs that similarly make use of the natural topography.